Have you ever found yourself snuggled in bed at 10pm saying “Just one more chapter” to then find yourself finishing said book at 2am? Your body hates you at 6am when your alarm goes off and you regret saying those words because you’re now going off of only 4 hours of sleep, but you try to reason with yourself by telling your tired body that the book was worth it. (They’re always worth it, right?) I have a love/hate relationship with these type of mornings, but I’d be lying if I said I didn’t love staying up into the wee hours of the morning to finish a great book. So there I was, last week, driving into work listening to my favorite local radio station while sipping on my morning cup of coffee trying to wake up my sleep deprived body from my late night reading. I kept saying those four words the evening prior and found myself in a tug-a-war with my body the morning after. As my car pulled into work, one of the hosts started talking about her upcoming monthly book club and a recent study about bookworms being happier than someone who doesn’t read or have books in their life. I thought about this for a moment, and while I’ve always read and have nothing to compare this to, I wondered if reading books really does make me a happier person? Everyone has their own reasons for reading: Pure enjoyment, peace, escapement, or possibly to gain more knowledge. We all have busy schedules, whether bringing kids from activity to activity, traveling for work, running errands, or being a social butterfly. It can be quite exhausting at times. I started pondering why I love to read and how it makes me happier. Is it the escapement from my own reality that puts me in a better mood? Reading brings me peace. There’s nothing better than a bubble bath, glass of Pinot Noir, and a great book. It calms my mood, and I find stories that can hold my attention make me feel and connect with the world. What I mean by that is, I find myself becoming more empathetic to others in my daily life. Stories, no matter their genre, really expand my mind and make me see things and people in a different light. I love that feeling, and I love when readers tell me this from the stories I create. 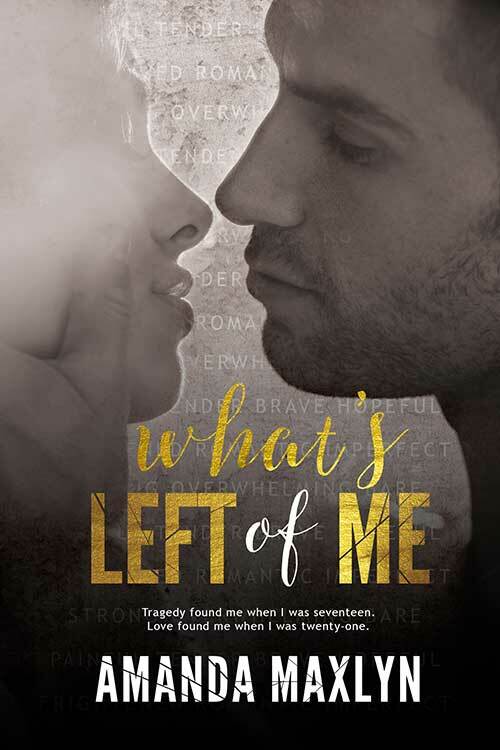 After I wrote What’s Left of Me I had so many readers email me or come up to me at signings and share their own personal struggles. How my words opened their eyes and brought them closer to a loved one who was going through the same thing as my character, or how they were going through the same situation and it gave them courage. Aundrea’s strength showed them they could find happiness in the darkest of times. But What’s Left of Me isn’t just filled with sorrow and pain, it’s filled with love and passion. Readers not only laugh with Aundrea, they pray with her, cheer for her and smile with her. My heart and soul is in these characters. Aundrea is a huge part of me on a personal level and you’ll see that as you read about her dreams. It’s an emotionally charged love story that I wrote as my outlet. Her story is mine. So when I have readers tell me how my words made them happier and really appreciate life, it makes me feel like I found a purpose. I can’t say that people who read are happier than those that don’t read, but I can say reading makes me a happier person, and writing stories that make you happy brings me a sense of peace. Reading helps me develop my own creativity, distracts my mood, inspires me, gives me something to talk about with others, and relaxes me. This is why I create stories for readers. I want to give you hope, inspiration and allow you to escape into my world and go through all the emotions I did while writing it. No matter the reason why you read, keep reading! The love we have for books goes so deep and us bookworms need to stick together!